The 2013 Gateway Report is an annual report on projects from Spring 2013, and features student work from Gateway Projects. This report also shows how the BAC's Practice Department has found ways for students to build their resumes and find experience when the economy does not necessarily provide them with entry-level design jobs. Since 2008, the Gateway program has served nearly 600 students and nearly 80 different local non-profits and neighborhood groups; it is a true learning laboratory, where students are actively engaged in applied, project-based learning, interacting with and serving community clients, and participating comprehensively in a wide variety of projects. All statistics used in the report were generated through student surveys and the Practice Department's data collection from students and their programs. Click here to read the report! 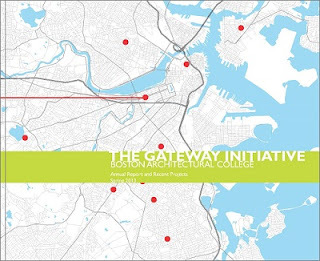 The Gateway Initiative is a truly collaborative, relationship-driven endeavor, and the Practice Department is always interested in learning more about ways they can engage the wider community in Boston and beyond. If you would like to engage the work of the Gateway Initiative, please see page 31 of the report for more information, or email practice@the-bac.edu.